The bright spring blossoms of marsh-marigold look all yellow to us, but bees see them differently because they can see ultraviolet light. Bees see a pattern that guides them to the center of the flower, where the nectar is. The branches are still bare and the day is chilly, but you know it's spring when you see a bouquet of bright yellow blossoms sticking right out of a swiftly flowing stream in the woods or the still waters of a swamp. What's this welcome flower that blooms so early in wet places? It's marsh-marigold (Caltha palustris). The plant has hollow stems and dark green, glossy leaves that are usually kidney-shaped or heart-shaped. You might spot it blooming between mid-April and mid-May. Marsh-marigold thrives in the wetness of spring and the sunlight that reaches the ground in places that will soon be shaded by foliage. By summer, you'll find no sign of it. Its leaves disappear by then, but its roots survive underground until the next year, even if the streams and swamps dry up. To see marsh-marigold in Westborough, look for swamps, streams, and wet meadows. Check the Assabet River in the Headwaters Conservation Area behind Mill Pond School. Look in the swampy areas on either side of the river near the site of the former log bridge. Crane Swamp is another good place to check. Take the Lyman Street east entrance to the Westboro Wildlife Management Area, on the east side of Lyman Street (near the state hospital transportation grounds). Walk along the access road toward the trails that lead to Sudbury Valley Trustees' Cedar Hill Reservation. Look for marsh-marigold as you head away from the dirt parking lot, with Crane Swamp on your right. The yellow blossoms stand out so vividly in the leafless landscape of early spring that you'd think marsh-marigold would need nothing more to attract bees and other pollinators. But like many other yellow flowers, the blossoms also reflect ultraviolet (UV) light, making a pattern that human eyes can't see. We just see yellow flowers, but bees do see UV light. It reveals a bull's-eye and other patterns that guide them to the nectar at the center of the flower. Marsh-marigold flowers may also have a scent that human noses can't detect. Marsh-marigold is native to North America, as well as to Europe and Asia. It was mentioned in Shakespeare's works (about 400 years ago) under the old name "Marybuds." In medieval times, it was used in church festivals to honor the Virgin Mary, and it was a popular flower in May Day celebrations. 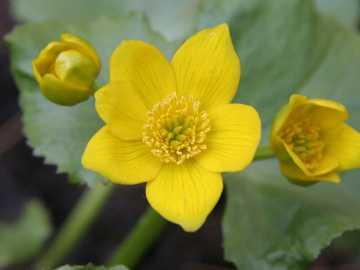 The name marsh-marigold refers not only to the marshes where the plant grows, but "marigold" or "Mary gold" probably also refers to its association with the Virgin Mary. A German legend tells a story of the first marsh-marigold. A maiden named Caltha (meaning "cup" in Greek) fell so in love with the sun god that she spent her days and nights in the fields, trying to see as much as possible of him, until her body and spirit wasted away. The first marsh-marigold – a cup filled with the sun's rays – grew where the devoted maiden had stood. Marsh-marigold must have been a familiar and welcome sight to early settlers in New England, perhaps as far back as the pilgrims. Like the Native Americans before them, colonists picked the young leaves in springtime, boiled them in a few changes of water, and ate them like spinach. Some people gathered the flower buds, cooked them, and pickled them in hot vinegar to use like capers. People did not eat any parts of the plant raw because it contains an acrid chemical that is destroyed by cooking. This chemical irritates skin and mucous membranes and can be toxic. Most wild and domestic animals avoid eating marsh-marigold. Sniffing bruised plant stems can make a person sneeze. Like many other plants containing unpleasant chemicals, marsh-marigold was put to various medicinal uses in the past. For example, American colonists learned from Native Americans to make a cough syrup from a mixture of maple syrup and marsh-marigold tea. People also used tea made from the plant as a laxative and a treatment for sores, warts, and even fits. The flowers also provided a yellow dye that wasn't permanent. In spite of its name, marsh-marigold is not closely related to the marigolds (Tagetes, Calendula) that we plant in our summer gardens. Instead, it is in the buttercup family (Ranunculaceae), which is not surprising when you notice how similar marsh-marigolds and common buttercups (Ranunculus acris) look. It's even less surprising if you notice that animals in a pasture seem to eat everything except the buttercups, which contain a acrid chemical similar to the one in marsh-marigold.